Alexander Templeton was born in the year 2355 to a pair of Starfleet Officers on Starbase 105 where his mother was stationed. After discovering she was pregnant she requested to be stationed planet side or to a Starbase to give birth. After having Alexander his mother was unable to get back on the command track and remained a junior science officer at Starbase 105 until her death in 2371. Because having Alexander stalled her Starfleet career which led to the end of his parent's marriage Alexander was not close with his mother despite living with her on Starbase 105. A few months after his mother's death Alexander was informed that he was accepted to Starfleet Academy on Earth where he began attending shortly after his 16th birthday. Alexander idolized his father even tho his father was not there which led to Alexander electing to follow in his father's footsteps and become a security officer. As fate would have it he was assigned to a Starbase after his graduation from the Academy where he served for almost four years before getting the Hawking to be Assistant Security Chief. 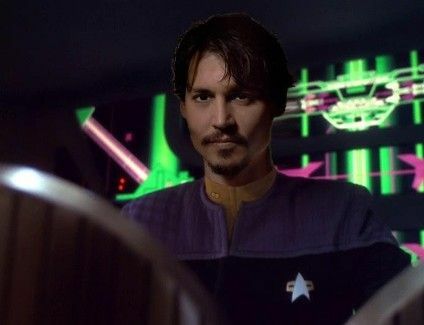 he was estactic to be the Assistant Security Chief on a starship just like his late father who died while he was at the Academy.